Ask open-ended questions in your online survey. Analyze the feedback thanks to our semantic analyser! You will understand everything ! You want to find out what is going wrong with your collaborators or clients? What you could do to better satisfy them or solve their problems? Ask openly to all your eco-system what do they like, what you should change or add, and why : they will tell you, with their own word, in a benevolent way! Dare to ask open-ended question! Surveys aim most of the time to evaluate, to mesure, to quantify ; they limite the answers to selected and determinated choices, leaving the respondant frustrated, having no possibility to express himself on the subject. Let’s consider the “others” (collegue, internal ou external client) as main sources of improvement ; collecting feedbacks and recommandations help to get lots of concrete answers, good ideas to set up or areas to work on. Why shoudln’t you do it? “Because of the huge amount of collected answers in natural langage, not easy to treat manualy”, is the most common answer. How analyze your verbatims ? Stop spending hours or days sorting the verbatim on excel! You can ask us to analyse them for you : you will received days after ther closing of the campaign the report directly exploitable, with all verbatim sorted by theme. You will understand all the issues, be ready to share it otr/and make your own conclusions and action plan. VYou can also use the analyser by yourself in full autonomy and discover how simple et powerfull it is to categorize all the verbatim by thems. If ever the data were collected through an other tool (Googleform, SurveyMonkey, fluidsurvey, …), no problem, just import the datas into Sharequest and analyse them to generate the report. 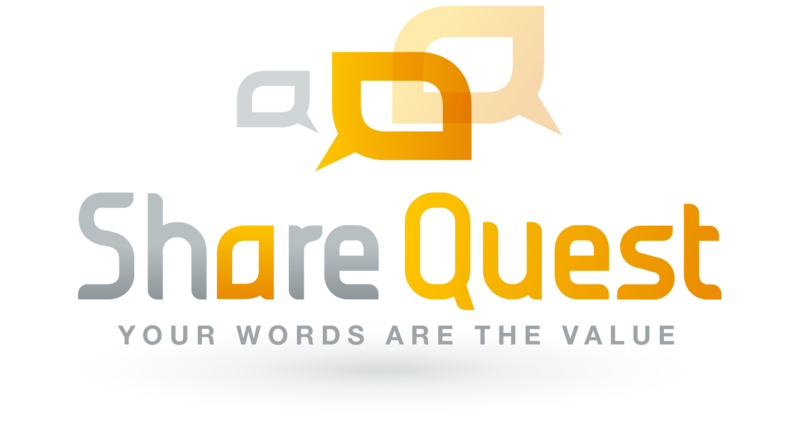 ShareQuest is avalable both in autonom mode or in “managed services”. Look at the video on the left or ask for a quote hereunder. Déclenchez votre enquête sous 24 h en un simple mail à ShareWizMe. Les répondants ont une semaine pour répondre aux quelques questions ouvertes (et fermées si besoin), vous recevez ensuite le rapport sous quelques jours que vous pouvez exploiter par vous même sans délai. Before a meeting, during a shared vision, a climate or engaging survey, to evalate the performance of service, … there are many opportunities to interview its employees or its customers, internal or external, its eco-system. Ask what they is going well, how we could improve, what projects to launch, the priorities, what are their dreams, their pride, their shame… They will tell you with their own words, and thus will contribute actively to the transformation of the organization.